Your tutor in a book! Master the essential mathematical skills for success! 'I don't know how to do this' is a refrain heard whilst many a student is doing homework. Parents are increasingly called on for assistance, but are themselves struggling to help their children. 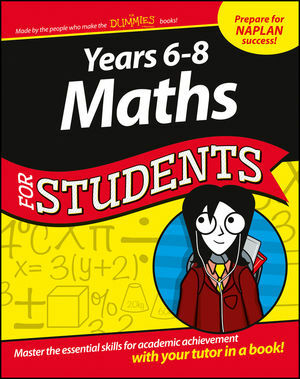 Years 6-8 Maths For Students is a reference guide for both students and parents, aiming to fill the gaps in a student's knowledge base, build confidence and reduce stress. Written with the same friendly, how-to approach of the successful For Dummies books, this new educational reference will empower students and develop their mathematical skills for exams, NAPLAN testing and, most importantly, life beyond secondary school. With worries that students are being taught to pass tests at the expense of understanding — this guide will help students cement their mathematical foundations. Save money on expensive tutors. Years 6-8 Maths For Students empowers students to improve their educational outcomes.